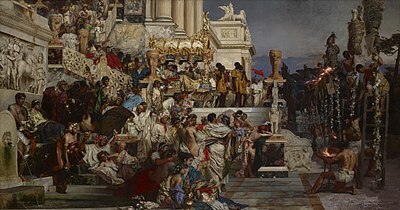 You are at:Home»Society»Crime»December 22, 69 AD: Life as a Roman Emperor Was Hazardous! December 22, 69 AD: Life as a Roman Emperor Was Hazardous! On December 22, 69 AD, the reigning Emperor of Rome, Vitellius, was captured and murdered on the Gemonian Stairs in Rome, proving once again how dangerous it was to be a Roman Emperor. The year 69 AD is also known as “The Year of the Four Emperors” which should give something of a clue as to how short one’s reign may be. The guy that succeeded Vitellius, known as Vespasian, managed to stay on the throne for 10 years, die of natural causes and be succeeded by his son Titus, who also died of natural causes. Unfortunately, the successor of Titus, his brother Domitian, was assassinated. 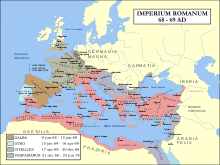 The Roman Empire during the Year of the Four Emperors (69). Blue areas indicate provinces loyal to Vespasian and Gaius Licinius Mucianus. Green areas indicate provinces loyal to Vitellius. Map by User:Steerpike and en:User:Andrei nacu. In the time prior to Vitellius, Julius Caesar, although technically not actually Emperor, was pretty much Emperor in everything but title, and of course he came to a bad end being stabbed multiple times by men he thought were his friends after reigning only 5 years. Upon the death of Caesar, his title of Dictator was abolished. The first man to wear the title of Emperor was Augustus who reigned from 27 BC to 14 AD, and may have been poisoned to death by his wife. The successor to Augustus was Tiberius, who reigned from 14 AD until 37 AD when he was murdered by the next emperor, Caligula. Caligula (actual name Gaius Julius Caesar) was infamous for his excesses and was himself murdered after 4 tumultuous years on the throne. Claudius then took the reins of power, only to be poisoned by his own wife in favor of her son, Nero, in 54 AD. Nero was apparently no gem himself, and was forced to commit suicide after a disastrous reign of 14 years upon which he was declared a public enemy by the Senate. Nero’s Torches (Christian Candlesticks) (1876) by Henryk Siemiradzki (1843–1902). The Year of the Four Emperors was preceded by Galba assuming the throne in 68 AD, only to be murdered by his own bodyguards 7 months later. His successor, Otho, committed suicide to avoid being executed by the forces of Vitellius when Otho’s forces were defeated in battle. Which brings us up to Vespasian. Of course, the time before the Emperors and the time after the era talked about here was not much safer for Roman Emperors, and if you look up the list of the various leaders of Rome and the Empire you will find an incredibly high percentage of top dogs that met untimely ends. As far as coming to a bad end, other kings, queens, emperors and dictators from all sorts of countries have had a miserable record of dying unnaturally as well. What baffles us at History and Headlines is that these monarchs that are supposedly ordained by God or The Gods to rule and sometimes even stake a claim to be gods or demigods themselves are so readily murdered, and the institution of the throne is not undermined and gotten rid of. Vitellius dragged through the streets of Rome by the populace (1883) by Georges Rochegrosse (1859–1938). Question for students: How can the public continue to allow such an institution as a monarchy? Feel free to give us your thoughts on the subject of monarchies, and while you are at it, let us know who your favorite Roman emperor was. Tranquillus, Gaius Suetonius. The Lives of the Twelve Caesars, Volume 09: Vitellius. 2012. Next Article Headlines: December 23, 2015: Jerks of the Year Awards!